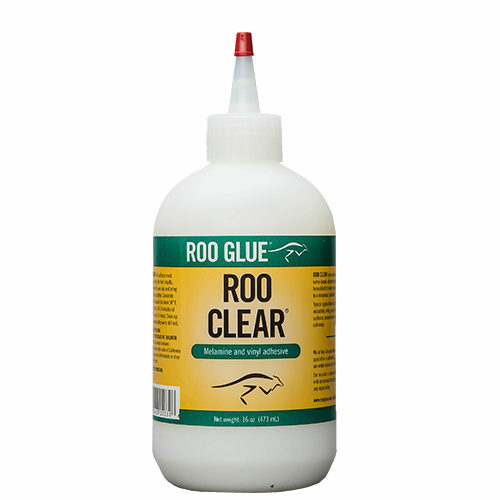 Roo Clear is the ideal product to bond a variety of materials and substrates. Clear-drying Roo Clear bonding glue is easy to use and perfect for bonding difficult nonporous materials like melamine, vinyl, PVC edge banding and decorative surfaces to porous substrates. Roo Clear also works great on lacquer, UV coated, painted or other finished surfaces. The professional’s choice for melamine glue. Bonds a porous substrate to nonporous materials like melamine, vinyl, high-pressure laminates, PVC edge banding, metal, stone, tile, acrylics, wood veneer, paper, fabric and craft applications. All surfaces must be clean and dry before using Roo Clear. For general assembly, first apply Roo Clear to a porous surface then join the two surfaces together. Assemble while the adhesive is still wet. Clamping, staples and/or screws are suggested to create a snug fit. Care should be used not to overclamp. Clean up excess wet glue with water. Clean up dry glue with denatured alcohol.